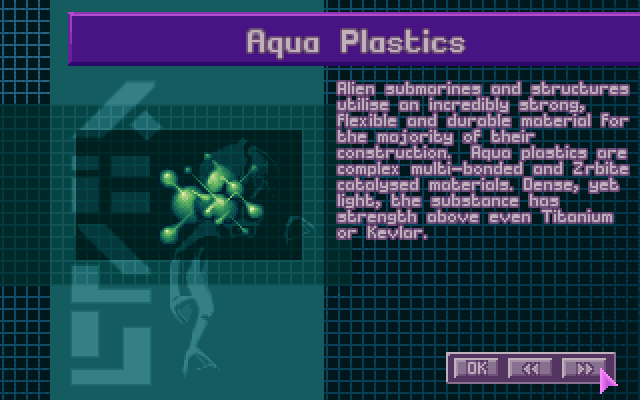 Our reserves of Aquatoids, being ill-suited for combat on the surface will have to sit this battle out. A new soldier will have to be cloned. Fortunately, I believe I have found that soldier. In the 65 million years T'leth sat on the sea floor, its computer gathered a lot of data. What I'm interested in are genetic samples of creatures found at that time, and how I can exploit that DNA to make our new warriors. A simple splice and modification of the DNA of long extinct reptiles with that of a human produces this - a Gill Man, a creature that can exist in both worlds, above and below the water. 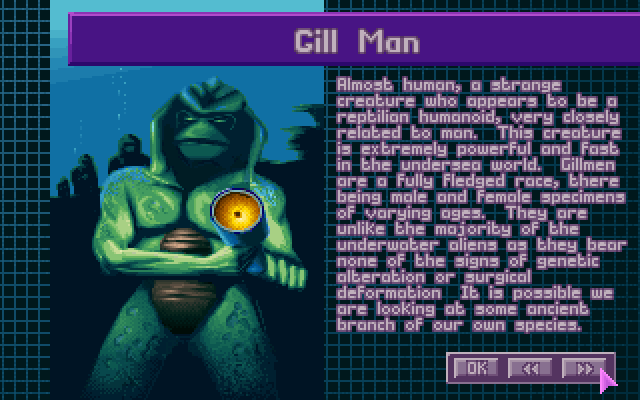 Possessing the strength, cunning and intellect of a human, these Gillmen don't need any enhancements, they just need to be implanted with combat knowledge and sent on their mission. There is a small issue with cloning them that needs to be resolved, so for now each unit must be grown from scratch using fresh DNA. On their own Gillmen are fierce combatants, but they'll need a powerful weapon to truly be a threat. I've always believed a biological weapon platform can be more powerful than a mechanical one, so I created the Deep Ones. Much like a Gillman, the Deep Ones are designed to be effective both above the water as well as below. They're constructed using whatever biological components are available - terminated clones, cyro'd organs for transplanting, even some of those X-COM soldier corpses we've captured. 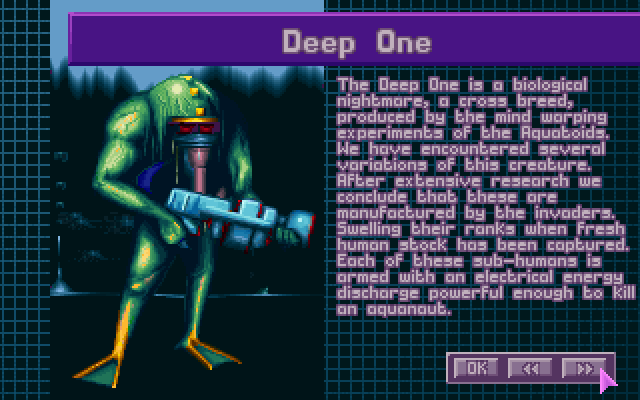 Once integrated with a sonic weapon, the Deep Ones can provide the heavy support we need to defeat the humans on their own ground. 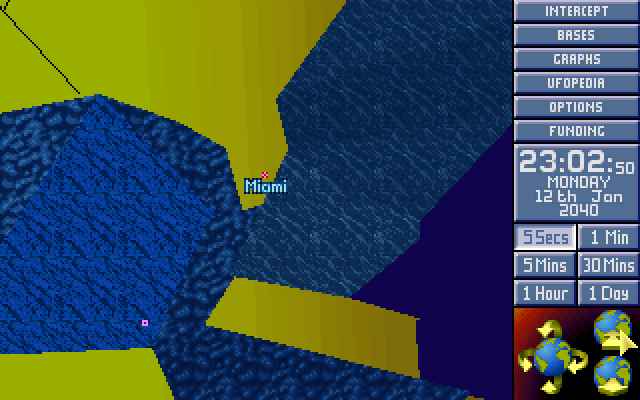 X-COM Soldiers attending: Nick Buntline III, Waylon Gesundheit, a man of ill repute, hafl, Tiny Turtle, Striker Pinkle, Tikiglass, Studly, ThunderPollen, Felime, Headcrab, Gatac, Hankor, Geno 'Soup' Soprelli. 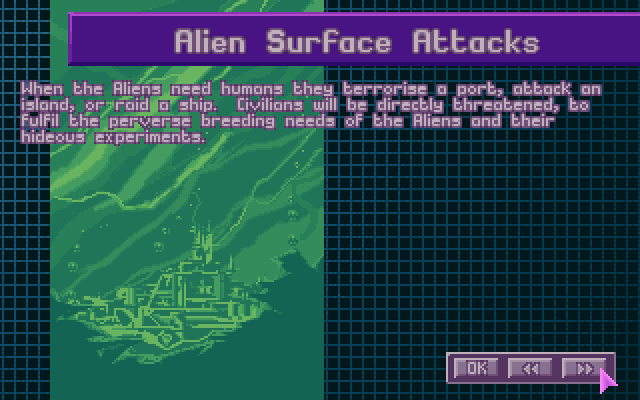 Results: Minor victory for the Aliens. Survivors escaping were Tikiglass and Geno 'Soup' Soprelli. 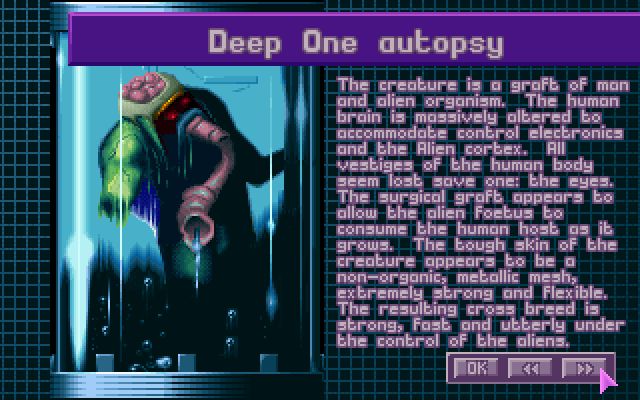 Deep One corpse captured by X-COM, Aqua Plastics now available for research. 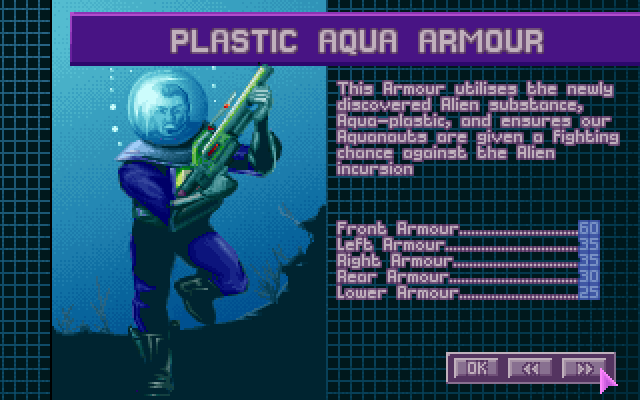 -Plastic Aqua Armor now available. When the Nigerians used their black market laser rifles to invade Florida, that was something. Though I guess with the state being seceded to them, it doesn't really affect me. I'll go with the colloidal Elerium what cured my restless leg syndrome. Cowards. The XCOMs showed up, just as expected, once we began our attack. And we pushed them back, suffering only somewhat mild casualties. Once the XCOM ship retreated, there was nothing to stop us. Local resistance was mild, attacking us mainly with medium velocity slugs of metal and the occasional beam of amplified coherent light, not enough to penetrate the armor covering on our Deep Ones. We killed and captured hundreds of humans, swelling our stockpile of organic material. We recovered more human artifacts and supplies and we soon expect to know a lot more about our human enemy, about XCOMs, and how best to defeat them. The XCOM rifle weapon is interesting technology, and worthy of future study, so that we may better resist its effects.